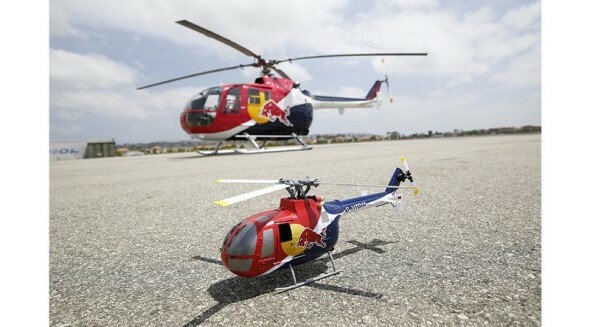 The Red Bull® BO-105 CB 130X is an accurate scale model of the famous Red Bull BO-105 CB, operated by the Flying Bulls, capable of the same aerobatics and more. This Heli not only resembles its full scale inspiration, it also performs with similar precision. Based on the Blade® 130 X platform, the power and agility of this model accurately mimics the aerobatic routines of the full scale helicopter. This machine has several scale features, such as the four-blade counterclockwise rotating head, 45° kick-up tail and even accurate rotor rotation. From the ground up, the experts at Blade helis wanted it to look and function in the same manner as its full scale counterpart. All these features and the addition of the world class AS3X® system onboard make for an unrivaled flying experience.